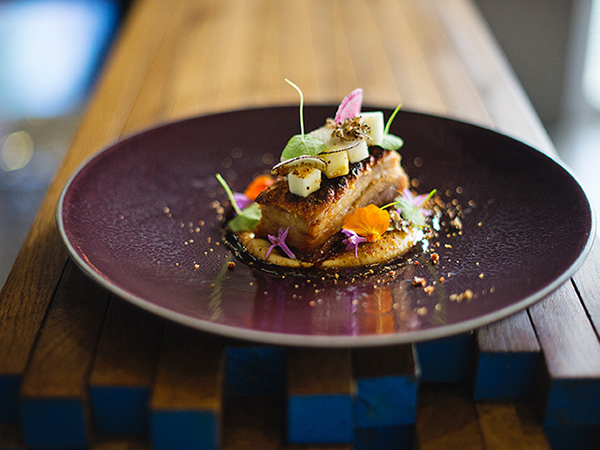 Fast-moving Jozi offers one of the most diverse dining scenes in SA. From ground-breaking inner-city revivals and genre-bending gastronomy to family-run favourites and trendy new hotspots, the choice of breakfast, lunch and dinner for Joburg residents and visitors is abundant. This selection comprises all the Johannesburg restaurants that made the cut for the 2019 Eat Out 500, the list of the best restaurants in the country as rated and reviewed by our panel of critics for the 2019 edition of the Eat Out magazine (on sale now). But we know the city is crammed with loads more gems and mainstays that didn’t crack the nod. Please tell us about your favourites in the comments section at the end! Expect a mix of favourites from the south, including umphokoqo with amasi; vetkoek fritters stuffed with savoury mince and chakalaka relish; ostrich fillet with butternut mash; and venison loin with biltong butter and sweet potato. From the north, the lamb-and-chickpea tagine is full of flavour. The Moroccan duck samoosas with dried fruit chutney are a crispy delight and the Egyptian dukkah-spiced rib-eye steak is a must. West African fare includes goat meat prepared in pepe-spiced broth and Senegalese-inspired tuna loin with okra. From the east, Ethiopian chicken or cabbage stew with injera pancakes and, from central Africa, Congolese guinea fowl with palm nut sauce and cassava leaves. Finish your meal with couscous pudding, caramelised plantain or sweet fritters. A fish dish prepared and served at Èpicure by Chef Coco. Photo supplied. What goes better with beer than pizza? Luckily, Impi Brewing Club serves both. Build your own pizza, but be careful not to go overboard. The standard base comes with mozzarella, and toppings include fresh basil and garlic, pepperoni, avocado and more. Look forward to generous portions of SA comfort food here. To start, South African snoek baked with whole apricots or ostrich bobotie frikkadels offer local flavour. A vegan burger is on the main menu, as is boerewors, umnqusho (samp and sugar beans) and an ostrich burger. These hearty dishes need to be followed by dessert. Options include Maroela malva, consisting of Amarula cream; a warm chocpot, which is a muscadel and coconut cream with vanilla shortbread; and soft caramel sandwiches. 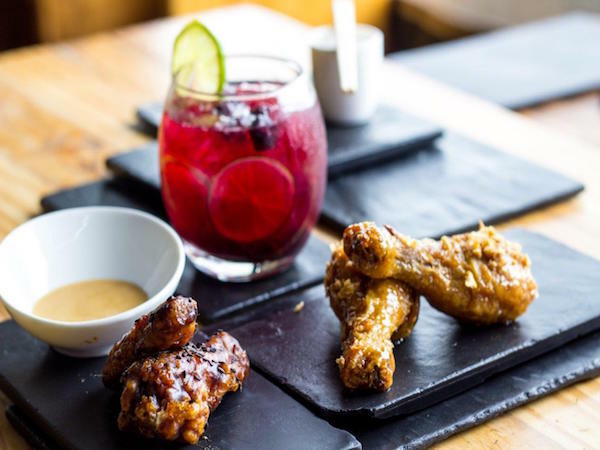 Mootee’s food and award-winning drinks draw inspiration from Africa. For starters, try the samp arancini with calabash relish and pesto, or springbok rolls with baby spinach, sundried tomatoes and caramelised onion. For mains, the beef boerie wheel, Zamalek and tomato soup is filling, and vegetarians are catered for with the butternut bunny or the aubergine curry with braised city-grown baby carrots. End on malva brûlée or koeksister bread-and-butter pudding. Prepare for an evening of wonderful Ethiopian cuisine. The authentic meal is served on platters, eaten by hand and best enjoyed shared with the table. Start with a combo platter comprising a Sheba salad of fresh tomato, onion, green pepper and jalapeño; sambuusas (an Ethiopian samoosa-like pastry) filled with lentils; and azefa, a spicy yet moreish lentil-and-mustard mixture all served on an injera flatbread. Likewise, for mains, the platters are the way to go. The lamb and beef stews are particularly fragrant, served with flavourful veg and legumes and more injera. End with an Ethiopian coffee, roasted and ground in-house. Each night sees slight changes to the menu here, but the usual starters fall somewhere between spinach-and-feta samoosas and a spicy butternut soup. There are four options for mains, including the delicate and aromatic butterbean and chicken curries and the occasional Jamaican goat curry and African beef stew. The stews are simple and comforting, served in enamel plates with sambals and crisped rotis. For dessert, masala-spiced pineapple skewers or koeksisters. The focus at Baha Taco is squarely on tasty, fresh and authentic Mexican fare; think wood-roasted nachos, cheesy quesadillas, gluten-free soft corn tacos and flaming jalapeños. Try the surprising flavours and textures of the potato-and-chorizo quesadilla, or stick with the free-range chicken quesadilla. There are plenty of vegetarian options, including a lively mushroom, pepper and jalapeño chilli quesadilla, or try the halloumi, veg and refried beans taco. Sink your teeth into the beer-battered hake taco – light tempura-fried hake on top of a delectable slaw. There aren’t any dessert options. 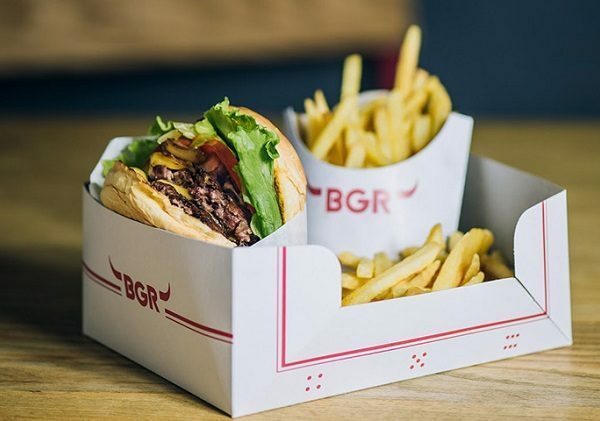 BGR’s burgers are generous, juicy, full of flavour and satisfying. The menu is quite small, offering only beef and veg burger options. The beef comes either as a plain or cheese burger, while the veg option can be either a herb-loaded patty or a grilled cheese vegetable patty on a perfectly proportioned bun. But, best of all, you can top it with anything you please: crispy bacon, piles of lettuce, tomatoes, grilled onions, pickles, raw onion, piquanté peppers and jalapeños. The French fries are always freshly cooked and perfectly crisp but come at an additional cost. A meal at BGR. Photo supplied. This is where happy hour turns into dinner. The complimentary snack of deep-fried crackers served with a spicy pineapple-and-tomato salsa whets the appetite for the dishes to come. Do order the Doubles – a nicely spicy lentil curry coconut curry bursting with veggies and served with warm Trinidadian flatbread and pineapple slaw. 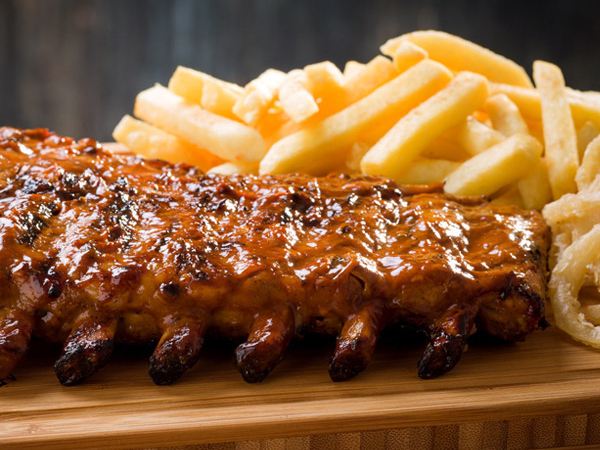 Always say yes to arguably the restaurant’s most popular dish – 800g of rum-basted barbecue pork ribs. If you’re in a large group, pre-order the suckling pig and red snapper 48 hours beforehand. Sides of sweetcorn fritters, coleslaw and spiced chips complement the fiery flame-grilled jerk chicken or crispy, beer-battered fish fillet. Expect a concise menu from fresh, seasonal and locally sourced ingredients. 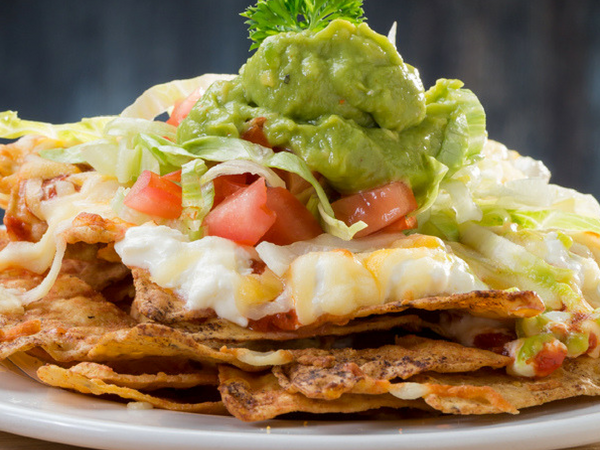 Sink your teeth into a plate of nachos with salsa and smashed avo, or go for the tortilla chips with a hot artichoke-and-jalapeño dip. You’ll find an impressive double bourbon cheeseburger comprising two juicy patties and a double serving of melted mozzarella. Serious carnivores will delight in sticky ribs in a home-made barbecue sauce, chipotle rotisserie chicken or chimichurri dry-aged sirloin steak. For vegetarians, there’s a barbecue wild mushroom skewer or a side of comforting mac and cheese. End with chocolate brownies or apple pie. Inspired by Latin food markets around the world, La Boqueria boasts a wide selection of regional cuisine. Who knew that hot fried olives would be such fast friends with edamame? There’s something for every appetite, be it a white anchovy snack on two small slices of toast or 10 grilled queen prawns covered in caper salsa fresca. The ‘son of a butcher man’ dry-aged steak is huge. Make sure you still have space for dessert, because although they made a name for themselves with their white chocolate hazelnut gelato cookie Whoopie pie dessert, the gin-and-tonic tart or chocolate nemesis are equally formidable choices. Tapas at La Boqueria. Photo supplied. Kick off the festive sharing with a light nibble – the fiery, home-made jalapeño poppers will do – followed by a chipotle chicken, steak or slow-roasted pork burrito. Or pick from one of the 14 small plates, followed by a main meal from the classics. For a big bowl of comfort food, try the chilli, a spicy mix of minced beef and beans with all the trimmings, or the black beans with spicy aubergine, coriander cauliflower rice and fresh avocado. The tastiest dish is the tender spicy braised lamb shoulder taco, followed closely by the fish taco of lightly battered hake and a crunchy slaw. End with the churros. The Perron bar. Photo supplied. This is not authentic Mexican, but it’s certainly not Tex-Mex either. Start with a little plate with a soft- or hard-shell taco with spicy tuna sashimi marinated in soy sauce and sprinkled with sesame seeds; slow-cooked pork; lightly battered hake; spicy cauliflower and more. There’s ceviche and an interesting salad of quinoa black beans, orange and chipotle, and another with pickled baby carrot and broccoli. If you’re going to indulge in many rounds of tequilas or margaritas, then nibbles like jalapeño poppers, chargrilled corn, burritos and bigger meals such as beef chilli, slow-cooked pork belly or a bowl of beans with aubergine are hearty stomach-liners. Sweeten the deal with churros and dark chocolate. Sumting Fresh sells gourmet street food at Joburg’s most popular weekend markets, but now you don’t have to wait all week to tuck in. On weekends enjoy an Asian-American brunch of waffles, chicken, dim sum, biscuits and gravy, and churros. The rest of the week the focus is on fried foods. ‘Winging it’ – a basket of four deep-fried buttermilk wings dripping in sriracha mayo, with parmesan-caked corn on the cob and skinny fries – is delicious. There are two beef burgers on the menu and the sides are very tempting – think deep-fried mac-and-cheese balls and skinny fries topped with parmesan and Napoletana sauce. Don’t leave without trying a Sumting Fresh bao, served in pairs. The sheer variety of dishes at The Big Mouth can be quite overwhelming. Fortunately, there’s one thing this slick establishment seems to be most popular for: sushi. The tuna maki with sriracha mayo is delectable and the salmon skin futomaki with avo, cucumber and caviar is just as delicious. 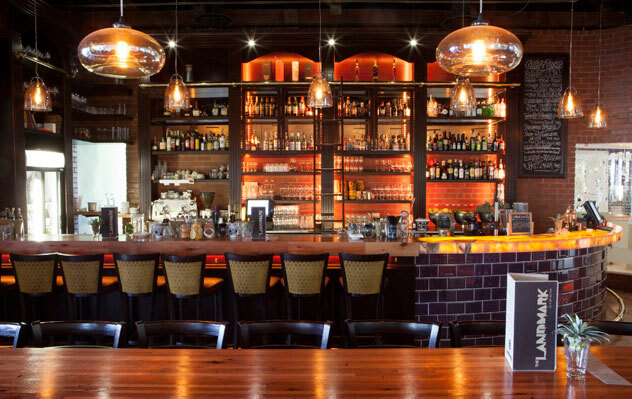 The grill offers excellent calamari, kingklip, lobster, steaks, ribs and gourmet burgers. Try the haloumi salad bowl with roasted butternut, chickpeas, a hint of mint, peas, roasted carrot and radish. The sweets are fun: from deep-fried Oreos to ice creams with flavours such as rosemary, pomegranate and Turkish delight or Vietnamese coffee. It’s not a Chinese restaurant and they don’t have a typical tasting menu. Su-yen, the chef, is part Chinese and her food fuses global influences. The menu uses the freshest seasonal ingredients. You could enjoy crab meat ‘lollipops’ on the claw with fresh salsa, or the best chicken soup of a lifetime: egg-drop soup with the depth of long-cooked mushrooms, corn and a swirl of noodles and egg. Vegetarians and vegans are beautifully catered for. Caramelised whisky banana serves as a taste and texture foil for the refreshing fruity-juicy pops of palm sago. Expect a variety of Asian ingredients imaginatively combined in tapas-like portions or noodle dishes ideal for sharing. 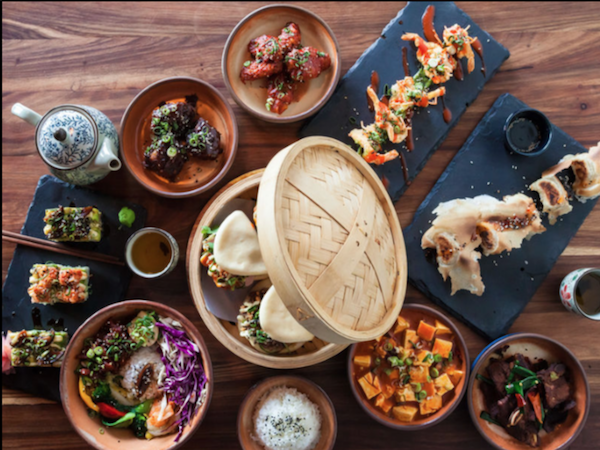 Try a fluffy steamed bun filled with an umami mixture of pickled shiitake mushrooms, cucumber and hoisin sauce; crisp and unctuous sashimi tacos with trout ceviche, tangy lemon pickle and sharp wasabi; or crispy fried tabasaki chicken wings with miso mayonnaise. Offset it with a crisp, fresh pile of Thai tangled salad and the hibiscus panna cotta with fresh strawberries and pomegranate compote. Tapas and cocktails at The Great Eastern Food Bar. Photo supplied. Popular starters here include bao, dim sum and sushi – the new-style sashimi is especially good. Japanese chicken yakitori with a sourish yuzu and fruity Japanese seven-spice works well, too. Or try the dependable tacos, beef sliders, crispy calamari and glazed beef ribs. The salads are particularly good, especially the sparkling green papaya. As a main course, the baby chicken is a crispy delight. Other mains include Thai curry, crispy duck, grilled prawns and spicy Korean-style lamb chops. The desserts are devastatingly good, especially the white chocolate and green-tea mousse. First there are tapas-type starters, like gyoza potsticker dumplings, pan-fried with a kimchi and tofu filling, served with Japanese plum sauce. The popular firecracker prawn comes butterflied, crisped with Japanese seven-spice flavouring and wasabi mayo. A bao as a main dish is just ideal – perhaps the Lucky Bao, a steamed bun containing tender smoky-sweet Chinese brisket, spring onion and coriander. A bao with a completely different but immensely satisfying flavour profile is the Kung Pow with Korean beef, kimchi, gochujang and mayo. For mains there are ramen bowls and a unique take on sushi. Momo Soko (Illovo) – Winner of the Asian-inspired category in Gauteng at the 2018 Best Everyday Eateries. Expect to find nothing less than perfect mapo tofu, which is braised in Szechuan pepper sauce and is headily aromatic and spicy. Fiery green beans are slathered in ginger, chilli and garlic and perfectly al dente; or try the twice-cooked baby beef ribs in barbecue sauce. Matterhorn soko and lamb with green basil-mint drizzle, toasted sesame seeds and spring onions is a must. Move onto fluffy baos, stuffed to the rim with various fillings. The baohaus bao is a favourite, with teriyaki beef, hoisin, Japanese mayo and pickled onions. Or try the exotic Kung Pow bao with spicy Korean beef, kimchi, sesame, gochujang, mayo and spring onions. The spread at Momo Soko. Photo supplied. PRON whips up tasty Asian deliciousness and whether you’re a meat lover or vegetarian, there’s something here for everyone in generous, affordable portions. The tapas – from shaved beef with plum chilli sauce to pig’s ear salad and tofu cubes in a spicy sauce – are a delightful mix of unusual flavours. Other options to choose from include bean paste beef noodles, dandan with pork mince, zachai (a pickled mustard vegetable) pork soup noodles, tofu, seawood and Szechuan chilli chicken soup. There are no desserts on the menu. With a commitment to MSG-free cooking, dedication to quality produce and a celebration of herbs and spices, Red Chamber keeps regulars coming back for beautifully fragrant, fresh and tasty authentic Chinese cuisine. Kick off with dim sum and the crispy sesame prawn toast and add the spicy cucumber salad for a fresh and zingy side. Moving onto mains, the signature Peking duck with paper-thin pancakes, julienned cucumbers and sweet-and-sticky plum sauce is great for sharing. The crispy beef tossed in ginger, garlic and chilli is a flavour explosion. End with a beautiful Chinese tea. Saigon is somewhat of a landmark for Asian dining. The menu is extensive, with everything from sushi to noodles and curries, meat dishes and more. 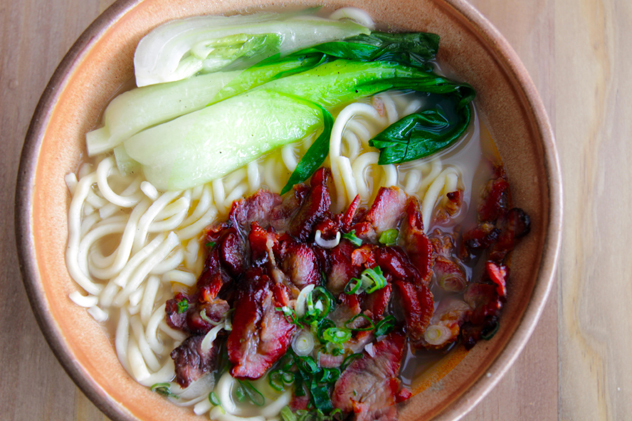 Definite must-tries include the pho bo, which is a flavoursome clear beef broth served with noodles. Prawn crystal salad rolls with mint, carrot, vermicelli and basil are served with a fragrant peanut dipping sauce. Other highlights are ginger prawns with chilli, chicken with chilli and lemongrass, and Saigon wok beef. Set menus are also available if you prefer to try a little bit of everything. The Asian-inspired menu features dishes such as soft and savoury Japanese rice porridge with shredded chicken, a teriyaki salmon omelette or traditional dim sum. 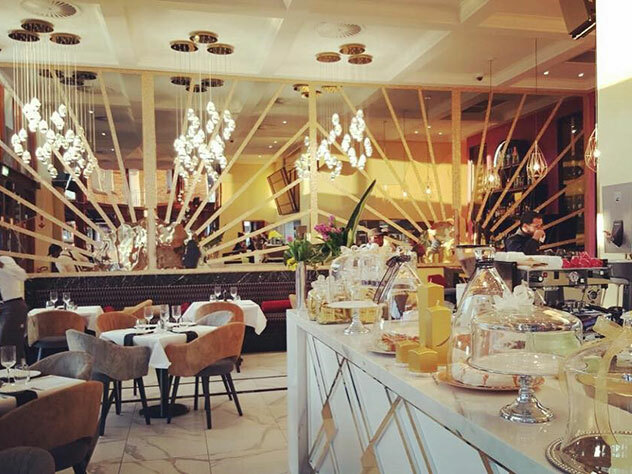 If you’re here early in the day, the breakfast menu consists of classics lent by Hemelhuijs in Cape Town. A perfectly soft-poached egg sits atop a herby tomato and onion smoor with grilled farm sausage. The home-made potato rösti, served either with herbed crème fraîche and soft-poached eggs or avocado and exotic mushrooms, is a favourite. Mieliepap with honey and butter takes you back to your childhood. Perfect sushi, dim sum, hot pots, curries and crisp tempura are on the menu. Tommy Wang, former sushi chef at Willoughby & Co at the V&A Waterfront in Cape Town, is responsible for this incredible little establishment. Standout dishes on the sushi menu include rock shrimp maki, new-style salmon sashimi and Hiroshima maki. Other must-try dishes include the beef tataki, prawn gyoza, udon noodles and pork-and-prawn dim sum. Wasabi’s extensive menu features an eclectic mix of flavours, spanning various Asian cuisines and countries. For starters, try the steamed gao dumplings with spinach and cream cheese wrapped in rice pastry. Those looking for a sushi fix can opt for the creamy rock shrimp California, dragon rolls or the springbok carpaccio roses served with camembert, avo and kewpie mayo. Look to the grill for mains; the Wagyu burger is a standout – a beautifully juicy 200g patty topped with just-about-to-melt emmenthaler. End with a decadent delight of deep-fried Bar-One nuggets served with caramel sauce and strawberry sorbet. The sushi is fantastic; expect top-quality fresh fish prepared with a delicate touch. An absolute must is the agedashi tofu: blocks of deep-fried tofu in a fish broth topped with spring onion, fish flakes, grated ginger and radish – the epitome of umami. For mains, the crispy kingklip and tonkatsu (a deep-fried pork cutlet) are fantastic. If you’re seriously hungry, opt to share a nabe mono (hot pot with broth served with different meats, vegetables and tofu that you cook at the table yourself ). For dessert, keep it simple with an assortment of ice creams and sorbets, a coconut milk tapioca pudding or a seasonal fruit platter. 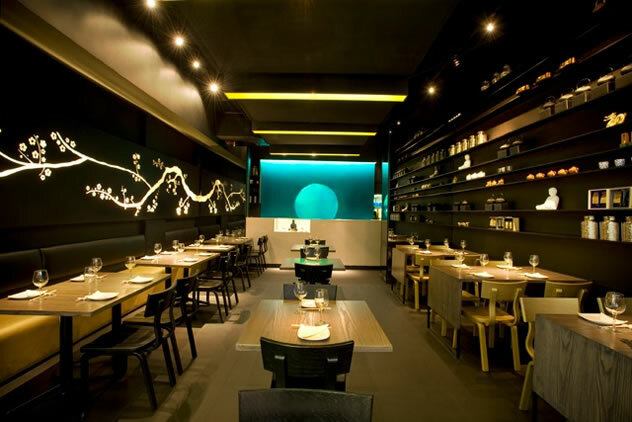 Yamato’s modern interior. Photo supplied. Head chef Omar Koenen’s regularly changing menu is a true reflection of his love of local tastes. You might start off your lunch with a pink gin-and-cucumber cocktail as you await starters such as sweet-potato-and-biltong soup and springbok carpaccio. Every mouthful is an absolute taste sensation with perfect balance. For mains, try the seafood hotpot served with squid, line fish and mussels. The beef fillet is divinely tender, served with new potatoes roasted in duck fat and cooked to perfection. The flourless chocolate cake topped with amasi ice cream and honeycomb makes for a light and perfect ending. Sip your coffee in the den in front of the fire. Expect value-for-money Mediterranean food. For starters, try the tender beef carpaccio complemented by peppery rocket salad. For mains, there’s the famous salmon burger or veal parmigiano. The crumbed veal is cooked in a chunky tomato-and-basil sauce and topped with parmesan cheese. The seafood risotto is packed with prawns, calamari and mussels. The tiramisu, from a fairly small dessert menu that changes weekly, is recommended. This restaurant offers a small, well-crafted menu with a lovely variety of continental cuisine. Guests get the best of both worlds: tasty food and wonderful ambience. If you’re there for lunch, the basil pesto grilled kingklip hits the right notes. For something a little heartier, beef fillet medallions, lamb shank or oxtail braised in red wine served with creamed garlic potatoes will satisfy. Desserts are classic: think crème brûlée, pavlova and a cheese platter. There’s a range of other special menus, including a vegan lunch option. Expect easy café fare. For breakfast, the oats with banana, goji berries, fresh berries and cinnamon sugar is a comforting bowl of goodness. Lunch options include leafy salads, gourmet sandwiches and burgers, and unfussy pastas. You’ll do well with the mussels in a creamy white wine sauce served with plenty of garlicky toasted ciabatta. For something meaty, try tender grilled lamb chops served with truffle fries or salad. There’s an on-site bakery, so dessert is a must: deconstructed lemon meringue pie with shortbread ice cream, and dreamy chocolate fondant with salted caramel and chocolate ganache. You can also book a themed high tea. 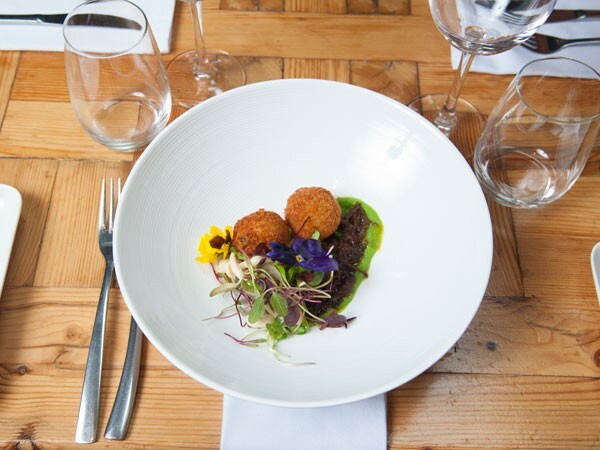 Snacks – smaller, more affordable starters – include lightly crumbed fishcakes served with a lemon mayo and Jerusalem artichoke velouté, which is comfortingly smooth and creamy. The crispy lamb shoulder main is an unexpected treat. It’s served off the bone and packed into a crumbed parcel. The pork belly is also full of textural surprises, served with long shards of pork crackling, soft pockets of gnocchi and a slightly sweet and crunchy apple relish. End off with a warm chocolate brownie drenched in thick salted caramel sauce. The extensive menu here – all presented on an iPad – includes everything from breakfast to casual lunches and refined evening fare. For breakfast with a twist, try the Shanghai eggs: steamed buns with crumbed poached eggs drizzled with coriander chilli sauce. If you’re with a crowd, the combo plates are the way to go, with the likes of Hong Kong fried chicken, fillet with Béarnaise and dim sum with spinach and pesto. The seared tuna with sesame seeds, veggies and noodles is a feast. The red Thai chicken is full of flavour and the braised pork belly is also a good option. Try the piña colada panna cotta or the green apple cheesecake with coconut ice cream to end. Breakfasts here are legendary, unusual and lavishly served. The breakfast dishes range in inspiration from Mexican through to English and Greek. The fine omelettes and scones always bring people back. Generous salads, sandwiches and home-made pastas are perfect for lunch. Hearty mains such as burgers (as well as vegetarian options), steak, chicken and duck with Middle Eastern or North African influences work well. Desserts are a fun feature – try the Seven Sisters: a rich choc-chip cookie sandwich around nougat choc-chip cookie ice cream. The home-made ice creams are a must: scoops are piled high with nutty, rosy fantasies. There’s a comprehensive menu of French regional dishes on offer. You should seriously consider selecting from chef patron Robert Baxa’s mouthwatering rundown of the day’s specials. Perhaps a duck salad starter with crisp duck skin morsels on lettuce topped with a perfectly poached egg, or mussels marinière in a delicate white wine sauce. Follow up with a piping hot cassoulet of simmered Toulouse sausage, confit duck, lamb and haricot beans in the traditional earthenware pot. The fish of the day or a selection of starters will satisfy vegetarians. If you have the patience to wait a few extra minutes, end your meal with a perfect puffed cloud of soufflé au citron. Breakfast offers an abundance of options, from healthy to decadent. You can’t go wrong with eggs Benedict or the ricotta hotcakes with honeycomb butter, banana and maple syrup. For lunch, salads are brimming with exquisite ingredients. The falafel salad with lemon tahini dressing and the haloumi, spinach, date and avo salad are two favourites. For something more substantial, opt for spanakopita, pure beef burger or Nonna’s meatballs and pasta. The central antique table boasts sweet delights like pecan nut pie and lemon meringue. Nibble on beef skewers marinated in Asian sesame sauce or smoked salmon carpaccio with capers and citrus. The sesame tempura mushrooms with soya are a delightful treat, and the chicken livers with a hint of orange and chilli are fantastically balanced. Salad-lovers have a wide variety to choose from, including roasted butternut, gorgonzola, citrus and nuts with herb salad, or crispy pork belly salad with leaves and nuts. For mains the oxtail – slow-cooked with a hint of whisky and orange and served with mash – is a hearty option. Or try the deconstructed sirloin with roasted butternut, sage butter, caramelised onion and pepper sauce for lip-smacking flavour. This restaurant – with an adjacent bakery, a deli, and a wine-and-gin bar – has a small well-thought-out menu. There’s a burger section plus a number of smaller plates and interesting salads, including one with roasted cauliflower and sweet potato, butter beans and parmesan. The ‘classics’ menu includes parmesan-crusted chicken breast, home-made pappardelle in a bright tomato sauce, and salmon fishcakes with green salad and aïoli. If you have space, try a slice of freshly baked cake, crème brûlée or poached stone fruit with olive-oil sabayon. Bone Marrow Steak Tartare: Beef fillet | bone marrow | duck egg | lavash | pickles | greens – one of the most popular dishes on our lunch and dinner menus. Although this tiny, much-loved space does serve lunch – unfussy toasties, open sandwiches and salads, with a dominant chicken or tuna mayo and salmon theme – it is at breakfast that they excel. Start with the Early Rise crumpet, topped with spicy tomato, a perfectly poached egg and ham. Or turn to The Hangover if you need all the help you can get: a no-fail, all-in egg, bacon, tomato, chilli and three-cheese delight. The French Stack (fluffy ciabatta French toast), comes with spicy tomato relish, a generous serving of crispy bacon, and is topped with melting parmesan shavings. Vegetarians don’t have much choice, but the oats with yoghurt or seasonal fruit do nicely. Freshly baked cakes, in full or slim slices, round out the offering. For breakfast it’s comfort all the way with bowls of oatmeal, omelettes, Meppel pancakes (Dutch baked pancakes) and eggs baked in a spicy aubergine, turmeric and tomato sauce. Lunch sees a wonderfully diverse selection of snacks, light meals and hearty plates. It ranges from hummus and crudités to beef croquettes; creamy chicken livers to spicy chickpea-and-spinach stew. The specials are pan-Asian, with dishes like prawn laksa and Kashmiri curry. Chef Martin Ferreira is best known for his ornate and decadent patisserie, confectionery and bespoke cakes. Breakfasts include Eggs Your Way (eggs prepared to your liking served with three toppings and toast); smoothie bowls; and an energy bowl of fruit, yoghurts, nuts and seeds. For lunch, you’ll find vegan offerings like a Buddha bowl and falafel wrap, pizzas and café items ranging from battered fish and chips to a Wagyu beef burger. The falafel served with pita, fried aubergine and dips makes for a tasty lunch. Sweets are the main attraction and include éclairs, cronuts, mini pecan pies, milk tarts, lemon meringue and an assortment of opera cakes. They’re the perfect pint-sized morsel for an afternoon treat. This coffee shop is adjacent to one of the best cheese shops in the city. Cheese Gourmet had us at all-day breakfasts: try the cheese duo frittata, topped with gruyère and mozzarella, or trout scramble with a dollop of crème fraîche and capers on top of scrambled eggs. Quick meals include the Cheeza Treat (chorizo, artichokes and olives on rye, covered in cheese sauce); the Fungi Trio (panini with mushrooms and a trio of cheese); or grilled baby camembert topped with fig-and-onion compote. Or choose from the sandwich bar, burgers or platters of South African cheeses served with bread, pickles and home-made chilli jam. Finish off with a fat slice of cake. Inside at the Cheese Gourmet. Photo courtesy of the restaurant. Start the day with a breakfast that could take the form of corn fritters with hollandaise or French toast. They also serve sandwiches: bread options include rye, seed loaf, baguette, sourdough and gluten-free bread, then pick your favourite filling. There are signature items such as burgers, beef fillet and fish dishes. A range of pastas and pizza also features. The vegetarian items are outstanding. For instance, the Buddha bowl, a delicious winter treat. It’s an ensemble of ginger-glazed edamame beans dusted with sesame seeds, oven-dried tomatoes, fresh pear, sunflower shoots, hummus and sweet potato chips. It has sweet flavour notes, a hint of chilli, and it’s so delicious. End with decadent cheesecake or brownies. Breakfasts are all-encompassing but the high-protein egg white and oat griddle cakes with honey and banana is popular. For lunch and dinner, start with the zucchini fritti or the cappelletti in brodo, a broth with stuffed pasta parcels. For mains, a veal dish hits the spot and the pollo farcito: tender chicken breasts layered with Italian cheese, wrapped in Parma ham and served with potato wedges is fantastic. The polpette parmigiana – traditional Italian meatballs in a Napoli sauce – is another bestseller. Dessert is a toss-up between dolci della Nonna (layers of zabaglione, cream, amaretti biscuits, pecan nuts and dark chocolate), affogato or some pastry nibbles. A spaghetti dish at Dolci Café. Photo supplied. Arrive bright and early and order a bowl of oats served with honey and nuts, an omelette, eggs on toast, or a bowl of muesli with yoghurt and honey. Later, try an almost endless range of sandwiches – all served with a delicious fresh Greek salad. Choose from seed loaf, 100% rye, French loaf, wholewheat or even a croissant, then start building your own sandwich, selecting toppings from the various meats, cheeses, sauces, marmalades, herbs and vegetables available. There’s a tantalising array of muffins, croissants and a cake of the day. This spot is ideal for breakfast, brunch and lunch any day of the week. Consider moreish options like various hummus-lined bowls filled with veggie goodness, tasty wraps, gluten-free pizzas and generous open sarmies. The burgers are the showstoppers. Try the Argentinian: your choice of a vegetarian, falafel or quinoa patty topped with home-made chimichurri on a freshly made bun. You could also go for a light lunch of spinach-and-feta phyllo or a vegetarian shepherd’s pie. As far as hearty, conscious and nutritious eating in Joburg North goes, this is arguably as creatively healthy as it gets. The vegetarian restaurant boasts a tantalising yet super healthy menu to accommodate all food intolerances. The lunch buffet offers sumptuous vegetarian dishes that will turn you into a regular in no time. In winter, tuck into shepherd’s pie made with lentils and topped with a butternut-and-potato mash. In summer, there’s a variety of pizzas with delectable Mediterranean-inspired toppings. A vegan fridge or baked cheesecake will seal the deal. Go for the cheap but generous Turkish breakfast comprising menemen, a traditional dish of spicy, peppery tomatoes, green peppers, scrambled eggs and melted cheese, a platter of olives, sliced tomatoes, cucumber, feta and a freshly made cheese-filled flatbread. For lunch, try tantuni, made with sumac-spiced strips of beef, onion and parsley and wrapped either in lavash wraps or served on Turkish bread. End with a fat slice of luscious mousse cake. This is a relaxed eatery tucked into the oasis of the long-established, family-owned Montrose Nursery. The fare includes several inventively named meals like the John Gotti full-house breakfast with eggs, rosemary-infused mushrooms, tomato, bacon or macon, sausage and toast; or try the Norma Jean fluffy omelette with a choice of fillings. The menu offers home-made burgers, salads, tramezzinis and toasties. The kitchen takes pride in the use of organic herbs, vegetables and fruit. Expect Parisian café-style food. Try the popular eggs in purgatory: eggs cooked in a spicy tomato sauce and served with sourdough bread. The lunch menu is filled with easy dishes like seared salmon with wild rice puffs and horseradish cream. Try the G’s chicken salad: the fillet is served with cauliflower purée, dauphinoise or braised short rib pot stickers. An on-site patisserie provides all the desserts. 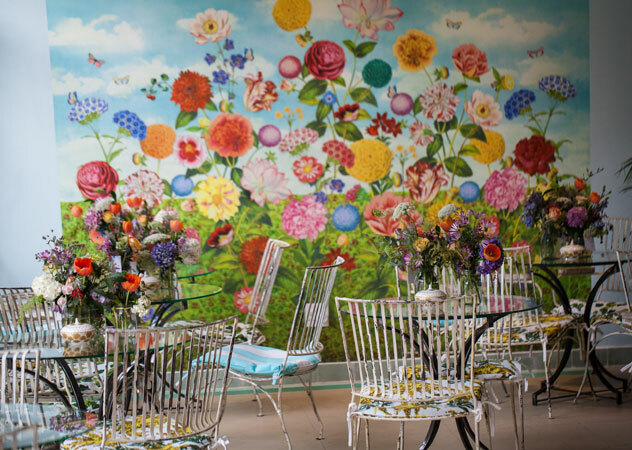 The Garden Room at Glenda’s. Photo supplied. The offering here is varied and appetising – edamame beans, wholegrain sushi rolls, oven-seared tofu, dhal, green curries, wraps, pastas, burgers, pizzas and breakfasts. The full English breakfast comprises scrambled tofu and vegan bacon. 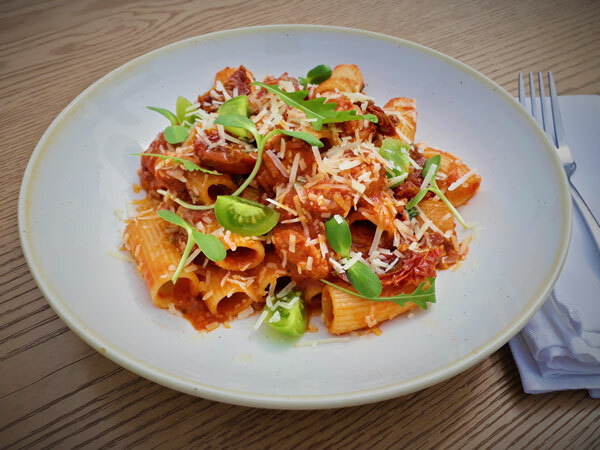 You’ll also find items on the menu such as a bacon cheeseburger, made with crispy tofu bacon, or spaghetti Bolognese with lentils and a choice of either gluten-free pasta or chewier tofu ribbons. There’s a child-friendly margherita pizza with avo, made with a wafer-thin home-made sourdough base and topped with Italian-style Napolitana sauce and brightly coloured creamy cashew sunflower cheese. Raw ice cream made from coconut cream, cashews and vanilla is a real treat. Andrea Burgener and Nick Gordon closed The Leopard in Melville in 2017 to reinvent themselves and open this fabulous deli concept. 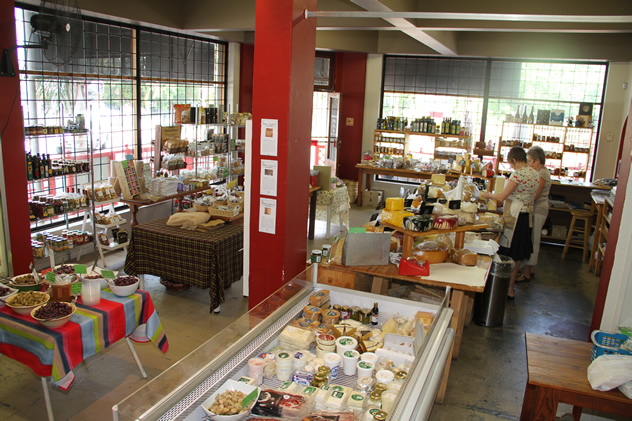 Lining the shelves is an array of delectable sauces, preserves, relishes and produce such as free-range eggs, charcuterie, meats and local cheeses. 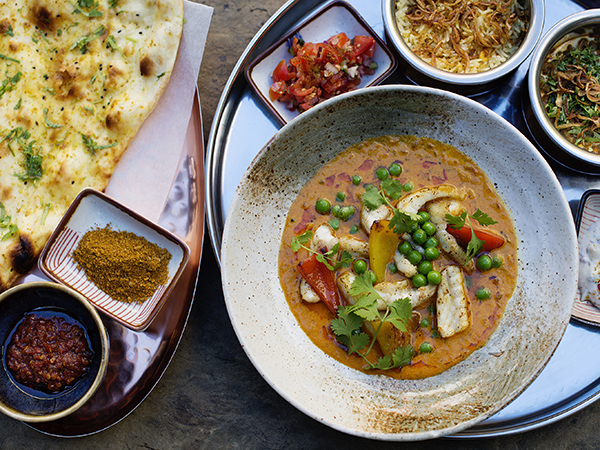 Indulge in the chicken-and-butterbean curry, the divine sea bass Goan-style curry or the grass-fed beef tartare. Or be virtuous with the Caesar salad with a twist. Either way, end with a decadent chocolate-coated marshmallow. 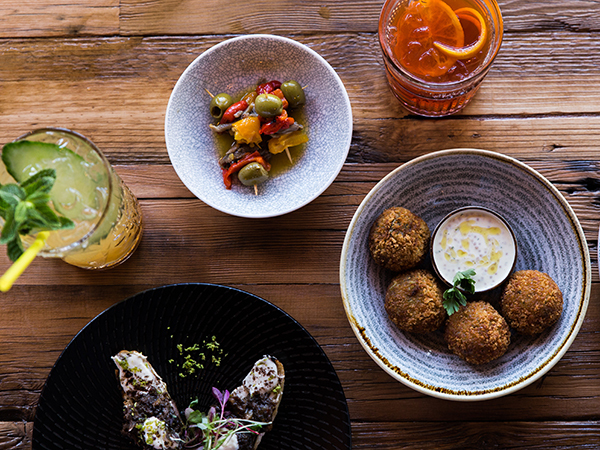 On Friday evenings you can enjoy small plates and drinks or book a table for dinner. The space welcomes you with a bright harvest table, groaning with freshly made yummy things, including salads (the black rice salad is a must) and hot dishes such as chicken curry. Their all-day breakfast offering includes four different variations on French toast (yes please to the bacon, parmesan and spiced relish situation) and generous sandwiches. Friday sees much-loved burgers with a proper veggie option on the menu. Leave space for delectable pint-sized brownies, home-made choc-chip cookies or a slice of lemon tart. Networking breakfasts and lunches at its best. For breakfast there’s classic avo on toast, or treat yourself to crumpets with bacon and maple syrup or bananas and dark chocolate. Lunch options include generous health-bread sarmies with a few green leaves garnishing chicken and mayo, pulled beef and gherkins, ham and cheese, or cheese and tomato fillings. For a larger appetite, the Big Papa panini is exactly that, stuffed with tender barbecue braised beef and mozzarella. Or go for the filling Mexican wrap with spicy mince and cheddar. It’s all about the humble egg here – in all its various incarnations; from fancy bacon-wrapped asparagus spears to accompany eggs and soldiers, to attention- grabbing pancakes smothered in Nutella and strawberries, and build-your-own fluffy omelettes. If you’re not up for the popular mild red shakshuka of poached eggs in a Middle-Eastern tomato salsa, make sure someone at the table orders a dish served with the addictive Yemeni flatbread. Have eggs any which way you want them, prepared with a trendy spin on ingredients. If you’re not feeling eggy, there’s also muesli and vegetarian sharing bowls that boast combinations like cauliflower, fennel, fries and hummus. Indulge in globally-inspired street food for the sweet-toothed: try a toffee apple bubble waffle stuffed with double caramel ice cream, tumbling with sweet praline nuts and slightly sour crisp apple chunks. Dessert tacos come loaded with sweet treats, ice cream and drizzled with caramel sauce. Try the nostalgia-inducing banana split complete with nuts, cream and cherries. Or how about giant churros with a caramel or chocolate dipping sauce? Else simply go all out with filled churros oozing with chocolate custard or white chocolate. The breakfast menu here boasts lovely eggs Benedicts, burritos and pancakes. Simple food from the freshest ingredients translates into starters of tender and crisp deep-fried calamari or Thai-style fishcakes accompanied by a crunchy Asian green salad that leave a fragrant kick in your mouth from the well-balanced flavours. Juicy handmade beef burgers, roast pork belly and a decadently sauced pepper steak are great meaty options. Cheesecakes, artisanal ice creams and brownies will keep even the biggest sweet tooth happily indulged. The menu offers breakfast, light meals, salads, burgers and desserts, and kids’ options. Try the Coastal Breakfast of smoked salmon, scrambled eggs and chives, served with freshly baked bread, or the Banting Benedicts, made of two poached eggs, hickory ham or wilted spinach served on a giant mushroom, topped with creamy hollandaise sauce. There’s a range of burgers, all available in banting versions. For something lighter, try the crumbed chicken and haloumi salad, served on seasonal greens with a honey-mustard vinaigrette. For dessert go for the pecan nut pie, chocolate brownies or cake of the day. The menu also offers a high tea platter for two. If you’re a regular here and always end up ordering off the classic menu (because who can resist the hummus toastie with rocket, avocado, tomato, feta and poached egg for breakfast, or the salmon tartare served with coriander, red onion, avocado and chilli and melba toast? ), you should force yourself to sample the ‘Inspired By’ menu. Start off with two or three medium Lüderitz oysters with a champagne cocktail. Then go on to tempura prawns, served with mayo, sesame rice balls, soya and lemongrass-and-chilli dressing. For mains, go for the tender cubed fillet, a generous 250g beef fillet with thyme and lemon zest, or the gourmet burger – a 250g beef patty with caramelised onions, oven-roasted cherry tomatoes and emmenthaler. There’s the standard menu, which is found in all Tashas branches; then there’s the signature menu, which is unique to each branch. The latter is outstanding here because of the source of its inspiration: the market. Expect a culinary kaleidoscope of fresh dishes that include chicken and wild rice salad, tom yum soup and grilled fish. The food is fresh, tasty, well made and beautifully presented. Desserts are in the form of baked goods, which change each day. The NYC-style breakfasts here include chilli eggs and hash browns, eggs Benedict and maple-bacon flapjacks. The signature menu also includes tacos – either fish or mince – with salsa; while the Upper East salmon bagel comes with thick chunks of lightly cured salmon trout accompanied by cream cheese, cucumber, red onion and sides of crisp coleslaw and kettle-fried chips. Ribs, burgers and American-derived salads all come in generous portions. Try a slice of luscious coconut-and-custard cake if you’re just there for coffee. Expect favourites with a twist, like omelettes with home-made onion-and-bacon jam, and creamy oats with spiced maple-poached apple. The flatbreads, also available in gluten-free versions, are the highlight of the menu. Must-try toppings include lamb meatballs with minted tzatziki, red onion and pickled cucumber, or honey-roasted aubergine with hummus and a double helping of feta and mozzarella. There’s a selection of speciality items that are sure to grab your attention: honey-mustard pork fillet with macadamia-nut crumble and butterbean mash; or the satay rice bowl with coconut-peanut sauce, carrots, spring onion and sesame seeds. The salmon salad comes poké-bowl style. There’s a children’s menu, as well as carrot cake or waffles for dessert. Need a good start to your morning? We've got you covered! 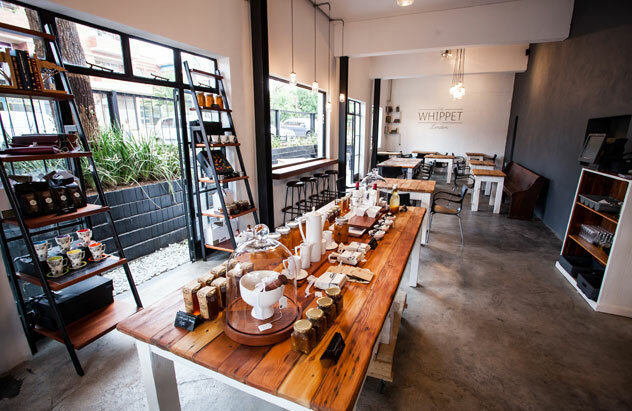 A selection of reasonably priced breakfasts at The Whippet include a French omelette, mango berry smoothie bowl, pork belly bao Benedict and the signature Linden breakfast sandwich. Lunch includes thyme-roasted bone marrow, citrus-marinated haloumi and a churrasco chicken burger served on a soft sweet roll with mint, red onion and mango aïoli. Zucchini fries, sweet potato fries, skinny fries and herb garden salad are fine accompaniments. A selection of cakes and pastries is available for dessert. The Whippet’s interior. Photo courtesy of the restaurant. 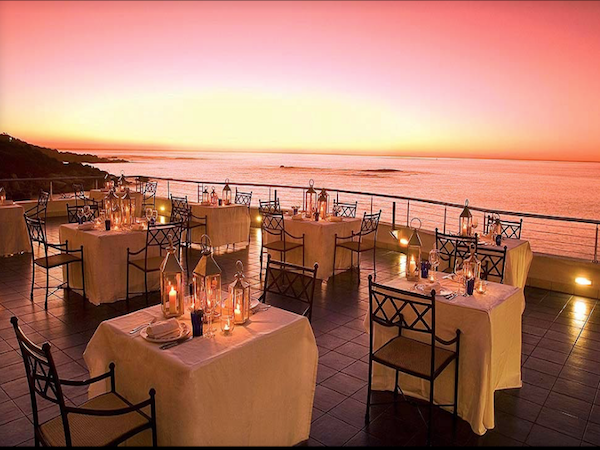 The restaurant is part of a high-end boutique hotel and offers breakfasts, casual luncheons and tasting or à la carte menus at night. A compact menu of seasonally appropriate food cooked with care and beautifully plated awaits you at dinner. Expect starters such as duck terrine offset by tonka-bean mayonnaise. For mains, succulent pork belly with lentils, a sprinkling of dukkah and curlicues of crackling, or braised lamb shoulder with slivers of dried olive are a delight. End the meal with bread and butter pudding topped with chai mascarpone, smoked cardamon ice cream and a perfect hot cross bun macaron. DW Eleven-13 remains a culinary gem. Chef Marthinus Ferreira is not only a wildly gifted chef and a mentor to many youngsters, but he’s also enjoyed time on almost every restaurant award list, both locally and abroad. A talented, elusive, sharp and honest man who does his own thing – especially in the kitchen. The eight-course degustation menu changes often to reflect the seasons and highlight the nest produce. Dishes such as seared scallop with mushroom purée, macadamia vinaigrette, porcini phyllo discs and baby pak choi sits alongside the popular roast duck breast with potato fondant, radicchio, cherry ketchup, burnt honey and duck jus. On the dessert front, the Valrhona chocolate marquise with salted butterscotch, passion fruit gel, and chocolate cigars is a culinary crescendo. Start off with the baby octopus teriyaki starter, which is cooked to perfection, while the tom yum is a delicious interpretation of the classic hot-and-sour Thai soup. If you’d like to stick to seafood for mains, options include prawn bisque tagliatelle and coconut-milk trout, or switch to the Three Little Pigs: slow-braised pork belly with sticky honey-mustard, soya-glazed eisbein, crispy streaks of bacon and crunchy pork crackling. Equally tempting is the beef fillet in a red wine reduction with truffles, and the duck magret. For dessert, go with Digging for Carats, a golden ball atop a slightly salty chocolate crumble, beneath which is a smear of crème brûlée custard. With chef Candice Philip – winner of the 2018 Eat Out Nederburg Rising Star Award – at the helm, Grei Restaurant impresses with its restrained and elegant take on fine dining. The six-course tasting menu heroes simplicity with the chef’s passion for herbaceous flavours woven throughout. Stand-out dishes include ostrich tartare that brings hues of purple to the plate, with red cabbage and sorrel. The duck is simply sublime, a study in flavour and texture, with the creamiest duck liver parfait and elements of apricot, thyme and walnut complementing a perfectly cooked duck breast. The finale is a glorious dessert of guava mousse, beetroot and hibiscus. The quail starter – partially deboned then pan-fried in herbs and white wine before being served with a bourbon-poached pear and rosemary-orange syrup – is a must here. Next, a scrumptious red-wine-braised oxtail, served with a perfectly cooked mushroom, parmesan and parsley risotto, steamed broccoli and Bordelaise sauce. To end off, go with the classic vanilla bean crème brûlée, served with still-hot popcorn and glorious salted-caramel ice cream. Menus change monthly, allowing for variation in ingredients, flavour combinations and creativity, according to seasonality and availability of various ingredients. The menu is available as a tasting menu with an option of wine pairing, and on Sundays sees a sublime lunch. Expect dishes such as silken cauliflower soup served with piquanté pepper ice cream and charred sweet corn; juicy clams with squid ink gnocchi and saffron sauce; and rich lamb tagine with couscous and prunes. The tres leches caramel cake served with pear and salted-caramel ice cream is heaven. The luscious fine-dining menu starts with smoked quail and sweet Spanish onions, poached quail’s eggs and pickled exotic mushrooms or a gorgeous lobster Caesar salad. 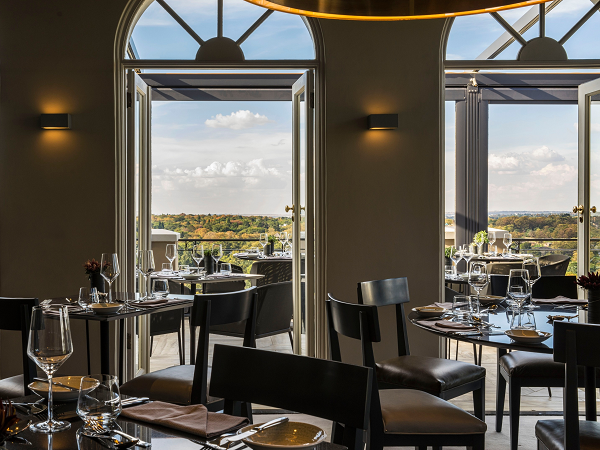 Main meals include a variety of local fish and seafood offerings, as well as carefully selected meat cuts, such as the succulent crispy pork belly served with a curried lentil ragù, cauliflower crème brûlée and confit leeks. Beef prime rib for two comes in two servings: roasted on the bone and served with potatoes, peas and carrots; and the rich roasted bone marrow with a truffle espuma, stuffed onions and garlic nougatine. There is a generous and enlightening vegetarian menu. The setting at Views Restaurant. Photo supplied. This gourmet destination is a must for adventurous foodies. Choose as many courses as you like from the delightful tasting plates. Herbs and vegetables come from the hotel gardens and the main dishes change at the beginning of each season. Dishes are intricately composed: a memorable example is ox tongue served with sweet, soft baby peas, contrasted with home-made slightly sharp pickles and spectacularly crisp radishes over a perfectly fresh marrow vinaigrette. Another main that shines brilliantly is monk fish Wellington enclosed in a retro delicate pastry and served with a lemony beurre blanc. The finale of cheddar ice cream is a work of magic: there are flecks of hazelnut and a quince paste topped with fine but pungent parmesan gratings. Starters include rich braised oxtail with parmesan buttered samp, bean salsa and curried chilli mango atchar, or scallops with octopus terrine, pickled apple and a maple turmeric vinaigrette. For mains, the steak Diane is highly recommended: fillet medallions are seared and flambéed with brandy, mushrooms and cream. For something lighter, opt for the seared salmon served with curried cauliflower. The desserts include malva pudding with Amarula crème, orange mousse, charred orange and vanilla custard, and a Peppermint Crisp tart with a twist. The Royal Punjab serves foods as delicious as those you’d expect from an excellent Durban eatery. For lighter snack options, they have veg, chicken and mince samoosas, as well as onion bhajiya. Bunny chows and roti rolls are available in mutton, chicken and veg. Chicken vindaloo and makhani are game-changing. The lamb – tender, cooked in spinach and cream – goes down as easy as a Sunday morning. Do try the magnificently creamy cashew nut and special sauce cooked lamb korma, also available in prawn and chicken varieties. This casual Italian eatery is a popular spot, as it’s 100% kid-friendly. Accessed from within the Lonehill Shopping centre, it’s a popular spot with the Lonehill Park Runners and offers great sports viewing. This is a quick-meal kind of place where you go to let your kids blow off some steam and relax a bit after a long week. The food is simple but yummy and serves its purpose. Pizzas are delicious with a selection of crispy or soft bases. Also on offer is pasta, snails, curries and pub favourites. The cuisine is traditional Italian and made with only the freshest ingredients. Daily specials include tender pasta pockets of ravioli stuffed with roasted butternut or freshly picked spinach and smooth ricotta with a hint of nutmeg. Specials include crispy squid heads with aïoli and fluffy potato gnocchi. The chef recommends the seafood risotto but they’re all fabulous. Pizzas are thin-based and wood-fired: the pizza Parma is piled high with peppery crisp rocket, thin slices of Parma ham and drizzled with truffle oil. All pastries, cakes and desserts are a delight. Cafe Del Sol Botanico. Photo courtesy of the restaurant. Expect comfort food with panache – taking Italian classics and re-imagining them with flair. For starters, you can’t go wrong with any one of the three carpaccios: smoked salmon, springbok or beetroot. Notable, too, are the creamy sage and mustard chicken livers and the crumbed squid heads served with a roasted garlic mayonnaise. Favourite mains are balsamico fillet and lamb rack; or try a freshly made pasta. Another standout is the chicken with porcini-and-pea risotto. Voluptuous cakes are a showstopper – the cheesecake and chocolate cake are musts, or try the salted caramel crème brûlée with popcorn ice cream. The specials are the real drawcard here. A starter of smoked salmon carpaccio with red onion pickle, fresh citrus, avo segments, little tastes of fennel, basil, buttery capers, vanilla crème fraîche plus an emulsion of blood orange and Campari is exquisite. Quite rightly, the Girlfriend oxtail risotto is an oft-sought dish, unctuous and rich. Desserts such as berry pavlova and crème brûlée hit the mark. Sunday lunches are an institution. The 1920s-inspired mirrors are a focal point. Photo supplied. A curated offering of superior pizzas and salads with genuine Italian accompaniments. The one-page pizza menu is sensibly divided into rosso, with tomato and home-made mozzarella, and bianco, without tomato. The pizzas are made with 00 flour and the dough is allowed to rise for two days before being baked to perfection. The Rosso Holtini features thick slices of coppa, brown mushrooms and parsley; while the Bianco Juliani is plump with courgettes, mushrooms and rocket. Also order a quintessential Italian dessert: tiramisu, panna cotta or affogato. A glorious pizza from Coalition in Johannesburg. Photo supplied. An extensive menu caters for everyone, with options for pizzas ranging from classic to gourmet; several popular pastas; a long list of ingredients for a build-your-own salad; gluten-free dishes; and children’s meals. You could start with antipasti such as melanzane (brinjal baked in a pomodoro tomato sauce topped with mozzarella); a Caesar salad with a robust dressing, croutons, boiled egg and spinach, served classic style with anchovies; or your choice of protein. Otherwise go straight to a good-sized pizza or creamy pasta with prawns and cherry tomatoes. Dessert could be a mini Nutella chocolate pizza or carb-conscious cheesecake. It’s all about traditional, home-style Italian cooking here. Start with a tricolore salad: beautiful slices of fresh mozzarella layered with tomato and avocado; or a starter off the specials board, like porcini and polenta with gorgonzola or thinly sliced ostrich carpaccio. Pizzas and pastas are where Gema really shines. The extensive offering includes thin-based pizzas with a selection of toppings – the Mario comes covered with paper-thin slices of prosciutto crudo. If pasta is what you’re after, the crab special is a must with perfectly cooked pieces of crab in a tasty tomato sauce. Rabbit, veal and quail could feature on the specials board. End the meal with tiramisu. For starters, the Gamberetti (prawn tails in a smoked tomato-and-basil salsa accompanied by an avocado mousse and lemon aïoli) hits the right note, while the beetroot, pear and fig tartlet topped with salty candied walnuts is delicious. The spicy free-range sous vide half chicken, served with duck fat potatoes and a rustic salad, is all homely goodness. Finish with the warm chocolate brownie made up of 70% dark chocolate, praline and Amaretto custard and served with vanilla gelato – this is dessert heaven. Mr Ciro, chef and owner, will appear to say hello to his regulars, of which there are many. A well-timed small bowl of starter gorgonzola snails, not too rich, is a perfect start. A smoking hot pan of mussels tossed in all the right ingredients – tomato, white wine, garlic and fresh herbs – and served with imperfectly cut but perfectly crispy fries is a saucy follow-up. The al dente porcini risotto is a creamy delight. You can also look forward to fantastic seafood, steaks, duck, adventurous vegetarian fare and simple salads. End with a delicious crêpe. The menu features dishes such as chicken tortellini in a herb broth, trippa alla parmigiana, rabbit cacciatore and 1kg Fiorentina T-bone. The fettuccine frutti di mare boasts succulent fresh mussels, clams, calamari and prawns tossed in a tomato, garlic and parsley sauce with a splash of white wine. On a winter’s night, the fennel-infused salsiccia on a bed of pesto polenta is ideal. Ask about banting, gluten- and wheat-free options. Ice cream is from Baglios and their chocolate truffle cake is to die for. 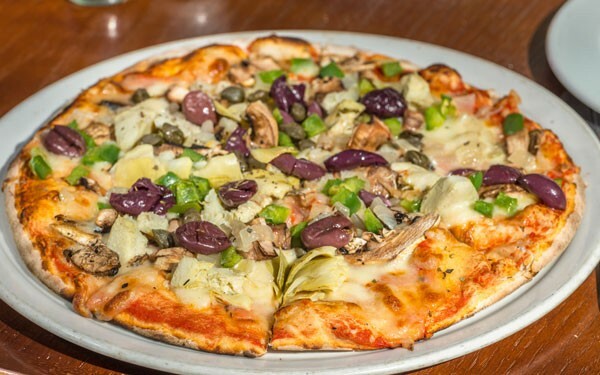 An olive-laden pizza at Luca’s. Photo supplied. Authentic Italian cooking is what Mastrantonio is all about. Antipasto is a good place to start, with the likes of carpaccio di manzo: gorgeous fillet thinly sliced and drizzled with olive oil and topped with shavings of parmesan and mushroom; or the melanzane of layered brinjal and tomato sauce topped with bubbling mozzarella and parmesan. For mains, try the light and fluffy home-made gnocchi, perfect with the four-cheese sauce; or the linguine porcini, heroing the mushroom with just garlic and olive oil coating silky pasta ribbons. 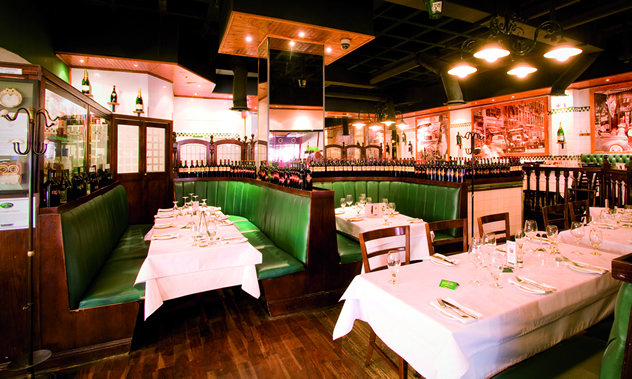 There’s a selection of chicken, steak and veal dishes all cooked in traditional Italian style. End the meal with tiramisu and an espresso. Start with the crispy deep-fried calamari served on a bed of zucchini fries, or the beef tenderloin carpaccio with balsamic vinegar, rocket and parmesan. The pizza bases are perfectly thin and crispy. Try the marinara with mozzarella, capers and anchovies, or the capricciosa with mozzarella, artichokes, mushrooms, ham and black olives. 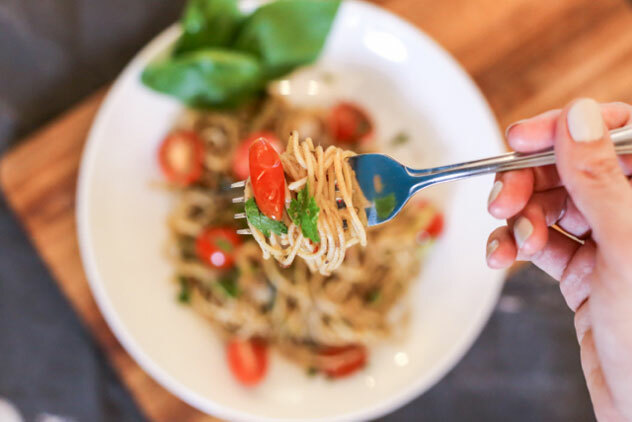 Look out for the blackboard with pasta specials for some tasty gems, such as spaghetti with blue crab or chicken ravioli with a light tomato-and-basil sauce. Risotto fans will battle to choose between the three equally tempting options: porcini mushrooms and parmesan cheese, Italian pork sausages and rosemary, or asparagus and prawns. Desserts are home-made and feature Italian favourites like tiramisu, panna cotta and gelato. Pronto has a big, primarily (but not exclusively) Italian menu. The portions are generous and the flavours sensational. Italian staples include a cheesy gnocchi starter sprinkled with pieces of crispy pancetta, assorted pizzas and lasagne. The seafood stew served with linguine is loaded with prawns and mussels and tastes of the ocean. Meatballs are served in a generous portion with a perfect sauce. Leave space for dessert: tiramisu, dark chocolate mousse, crème brûlée, home-made gelato and a few other ways to beat the blues, with mascarpone featuring prominently as a weapon of choice. 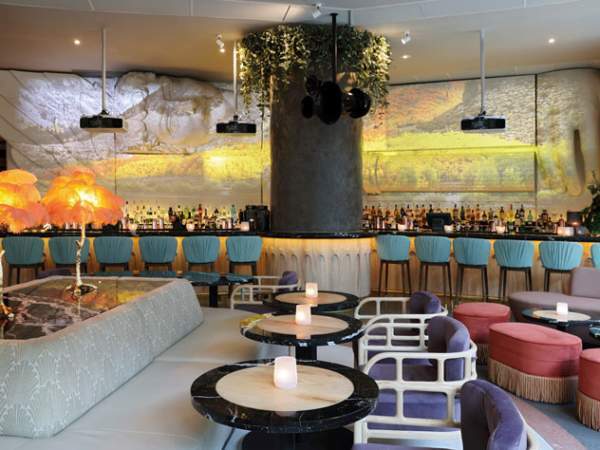 The latest venture of the team behind Marble, chef David Higgs and Gary Kyriacou, Saint’s menu features clever, sophisticated takes on classic Italian dishes. Start with the creamy burratta with wood-fired tomatoes or the crispy squid-ink croquettes. For mains, the pizzas are the star attraction. Try the perfectly balanced margherita or the more adventurous sirloin with caramelised onion and pumpkin seeds. The ricotta gnocchi is a standout, light and fluffy atop a textured romesco sauce with leeks and crispy kale or with Italian sausage and capers. Chicken and sea bass are meatier mains options. Finish with a rich tiramisu with mascarpone gelato. Inside at Saint Restaurant. Photo supplied. A series of blackboards showcase a range of classic pizzas and characterful pasta. Tuck into a seasonal salad, such as the artichoke, avocado and nut salad topped with mozzarella. As for the pasta, a simple Napoletana is flavourful and aromatic. Pizza is at the heart of the menu, and Trabella’s special consists of a base of peppers, mushrooms, olives, artichokes, sundried tomatoes and chilli, with the option to add mince, bacon or other meats. For dessert, savour Italian kisses or sorbet. For breakfast there’s an abundance of home-made breads, croissants, crostini, panini and great coffee, but lunch and dinner are the main events. The menu is divided into insalata, antipasti, primi, secondi and daily specials. There’s an impressive selection of pasta, all made by hand and delicious. For secondi you’ll find a selection of predominantly veal, chicken and fish dishes, all delicately prepared. There are many desserts, including a great affogato, a perfect tiramisu and devilishly good cannoli Siciliani, but the home-made gelato will keep you coming back. Starters include falafel served with tahini and pita bread, phyllo pastry parcels stuffed with spinach and cream cheese, and Greek meatballs in a tomato-based sauce. The open-plated meals are BBQ Workshop’s calling card and great for sharing. 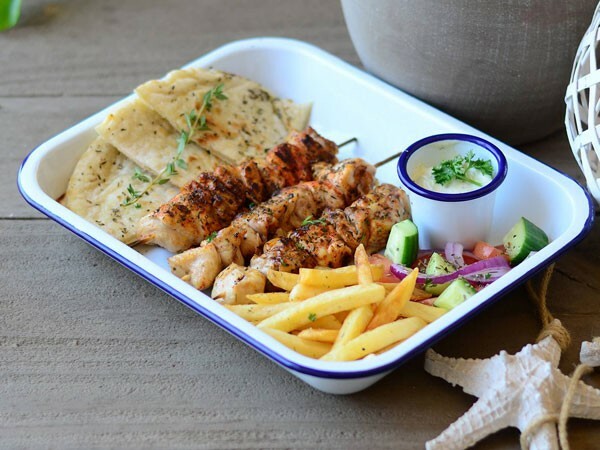 Choose between shaved chicken, beef and lamb or pork; or souvlaki skewers served with fat chips, tomatoes, red onions, pita bread and your choice of traditional Greek dip. The Village Greek salad with tomato, Kalamata olives, cucumber and loads of Danish feta is fresh and unfussy. Just don’t forget to leave some room for the gelato and freshly baked mini waffles. The one-stop concept is ideal if you want something quick and delicious. The menu is simple but tasty. You can’t go wrong with a creamy omelette with feta, spinach and mushrooms, or a filled croissant of smoked salmon and avocado to start the day. On the lunch side, have a duo burger: one slider filled with provolone, a beef patty and caramelised onions and the other with grilled chicken breast and cheese. The grilled peach salad promises blueberries, strawberries, grilled peaches, walnuts and mixed lettuce leaves with parmesan shavings. This Mediterranean deli has an array of amazing ready-made mouth-watering goodies, from marinated vegetables, olives, dolmades and meatballs to syrup-drenched baklava and kataifi. Expect a fusion of Mediterranean and Middle Eastern cuisine with a wide variety of mezze delights, seafood, salads and meat dishes. Kick off with a selection of olives, cheeses and dips. Mains include souvlaki skewers – beef or chicken – grilled on an open flame, yiros and home-made meatballs, to name a few. The grilled lamb chops, seasoned with salt and oregano, are a satisfying, flavourful option. If you prefer seafood, the line fish is a favourite, while other tasty options include baby octopus with a tangy lemon dressing and mussels with fresh tomato, white wine, feta and a bit of chilli. End with traditional baklava. 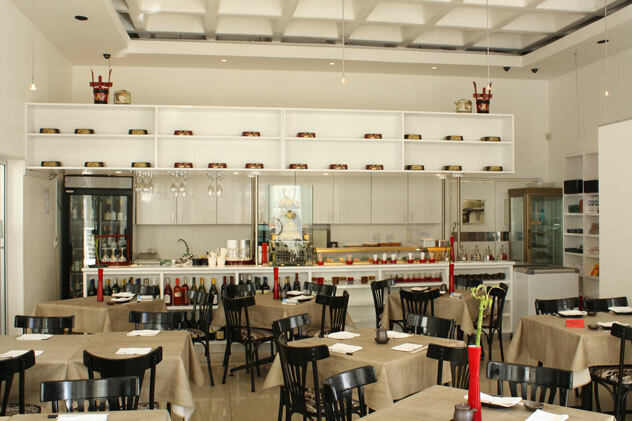 The menu offers an extensive selection of traditional Greek dishes with the occasional modern twist. Start with a selection of mezze such as fried halloumi, crispy zucchini fries, creamy tzatziki and silky smooth hummus. For mains the coal-grilled souvlaki (pork, chicken or beef) is available either on a plate or as a yiro – try the roasted brinjal and tahini or feta and peri-peri salsa. Other highlights are king prawns, skinny coal-grilled chops and the lamb burger. End with halva ice cream or sweet, sticky, flaky baklava and a Greek coffee. The souvlaki at Nikos. Photo supplied. Begin with a selection of dips (hummus, taramasalata and tzatziki), warm pita breads and a selection of mezze. Vegetarian options include htipiti (a grilled feta cheese with fresh tomatoes, pepper and spices), and dolmathes stuffed with herbed rice. Meatier mezze options are chicken livers or calamari. ‘In pita’ mains include souvlaki, yiro, haloumi and falafels. Or go for the souvlakia of tender lamb cubes cooked on skewers. End with a traditional rizogala rice pudding sprinkled with cinnamon, served hot or cold. To start, try the haloumi, cumin chicken wings and lamb-and-lentil soup served with Turkish flatbread. For the main meal, try the chicken pirzola (chicken thighs marinated in Turkish spices and grilled to perfection), cag kebab (skewers of spiced lamb cubes), and the vegetable platter. All are served with baba ghanoush, hummus, spicy rice, tomato marinated in pomegranate molasses and flatbreads. The dessert menu is small and changes seasonally, but the sweet and nutty baklava is always there. For breakfast the shakshuka is a must – eggs perfectly poached in a tomato, chilli and coriander sauce. There’s also eggs Benedict and a selection of scrambles. Satisfy a sweet tooth with Land of Milk and Honey: vanilla-infused kitke French toast topped with crème fraîche, halva and toasted almond flakes. For lunch, there’s schwarma on a plate with a choice of filling and a selection of salads, vegetables and sauces. Or go for the Reuben, filled with brisket, emmenthaler and sauerkraut. The salad offering won’t disappoint those looking for a lighter meal. Start with fire-grilled tomato soup served with naan and herb butter. The Artivist free-range burger, in an activated charcoal brioche with butter bean chakalaka and baby spinach, is highly recommended. For shisa nyama lovers, the nyama choma main of Karoo lamb, beef wors, pap and tomato relish is a smoky, tasty option. Pulled skop, served with dombolo and sous vide beetroot, is delicious, beautifully seasoned and tender. The limited dessert options include poached guava and dark chocolate brownies. Ingredients come straight from the family farm to your table, and the menu is constantly updated with new surprises. The cheese soufflé or Brightside duck liver parfait starters are perfection. Meat dishes are magnificent: try braised and smoked short rib or confit Brightside pork belly. The amazing care taken with greens and vegetables – such as a grilled heirloom pumpkin main or roasted beetroot salad – really sets them apart. The desserts always plate a pretty picture, such as the deconstructed lemon meringue tart served with coconut sorbet. Slow-braised Suffolk lamb shoulder with truffle arancini at Coobs. Photo supplied. Start with tapas dishes to share: haloumi fingers fried in crispy kataifi pastry, delicious when dipped in the accompanying lemon mayo, or the arancini stuffed with Tuscan veg and melted mozzarella. On to mains, the Josper oven is the hero, with dishes such as boneless chicken and an array of beef cuts cooked to perfection. Those looking for a less carnivorous offering can opt for a pasta or risotto; the wild mushroom risotto is packed with mushrooms and a decadent truffle cream. End the meal with a slice of poached peach tart with tarragon ice cream. The steak fillet with roast potatoes at EB Social Kitchen & Bar. Photo supplied. The chalkboard menu changes seasonally, but certain favourites always remain, such as the scrumptious zuppli and the sticky riblet. Look out for the silken mac and cheese studded with chorizo, crispy beer-battered fishcakes with orange-and-ginger mayonnaise, deconstructed pulled pork burritos, honey-and-lime chicken wings, arancini and zucchini fritti with fragrant tzatziki. Great larger sharing plates are available too, which include gorgeous fresh whole fish (depending on the catch of the day), paella and meat platters – the options are vast. For starters, the selection includes an appealing salmon cured with apple and fennel. The stunning ribbons of vegetable salad with a poached egg and fresh green dressing is memorable. 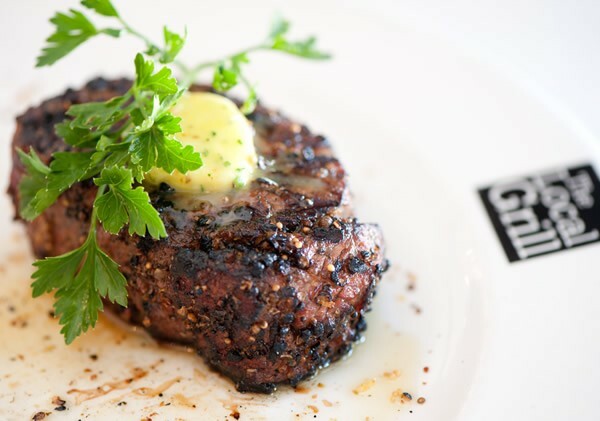 The aged meats are of admirable quality, like the Black Angus grass-fed sirloin and Kalahari rump. For dessert, crème brûlée is made even more delicious with rich lemon curd and there’s an excellent range of sorbets – try the fig and yoghurt. It would be silly not to start with one of the signature dishes, the bone marrow. A big chunky bone split in two provides a delicious, rich and buttery essence. Beautifully cooked and tender pesto duck breast with mash and gremolata is another favourite. Pleasing portions of pork belly, wild boar and other meats come from sustainable and organic sources. The vegetarian options are enticing: goat’s cheese soufflé, pumpkin pancakes and spinach frittata. The pastas and farm-to-table salads are flavourful options too. On a sweet note, try the ricotta-stuffed chocolate-and-citrus beignets or home-made ice creams, all wonderfully decadent. Amazing as a starter or simply enjoyed with a glass of wine – Focaccia with fresh fig, dolce latte, red onion and rocket. The butternut tart, with goat’s cheese, orange and pumpkin seeds, is delicate and delicious for starters. For mains, try the porcini-and-cauliflower risotto with truffle croquette and crispy onion, or dry-aged jersey rib on the bone served with seasonal baby vegetables, Béarnaise and peppercorn sauce. The dessert menu is filled with classic French desserts such as chocolate fondant and crème brûlée with berries. There’s an interesting mix of crowd-pleasers – like crispy squid heads with lime aïoli-type sauce, or fried haloumi with punchy mango atchar – and more unusual options like the three-cheese fondue with goat’s cheese croquette and crispy poppadoms. Order a side of truffle fries to lap up this melty mix of blue cheese, mozzarella and emmenthaler. The duck cigar is slow-cooked duck wrapped in phyllo, or try the miniature bunny chow. 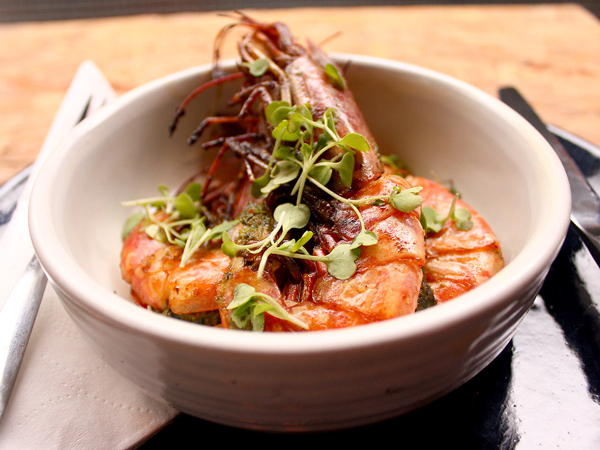 The fire-roasted prawns at The Lonely Hearts Club. Photo supplied. A small menu takes inspiration from the illegal shebeens of the 1920s and 30s. The grilled cabbage with mussel powder, apples and miso mayo is light and tasty; the KFQ (deep-fried quail, kimchi slaw, Japanese mayo and salsa verde or chimichurri) makes you want it all for yourself. The flavoursome amiche – a country-style pizza with confit onions, pickled onions, comte cheese cream and horseradish – is divine. Leave space for the Sunday roast of beef rib-eye served with bay leaf poached potatoes and green beans. End with roasted peaches and yoghurt parfait with olive oil. Even though this is a steakhouse with a well-used open-flame griller, chef David Higgs’s past in fine dining shows. Expect an enticing spread of light Med starters to heavier Argentinean-inspired grills with some South African twists. Shellfish on a braai is a visual feast and a tender treat; another must-try starter is the grilled aubergine with baba ganoush, kimchi peanut brittle and sesame. The rib-eye steak with a rich Béarnaise and smoked bone remains a fan favourite, but the grilled pork belly is popular too, served with mustard sauce, teriyaki sweet potato, pork crumble, and apple salad with a lime, honey and ginger dressing. Desserts hearken to childhood treats: think ice-cream sandwich and cheffed-up rosewater koeksister with khulfi ice cream and a pistachio tuile. We’re open! Pop in for a drink at the bar or join us for a last minute luxe dinner. Theirs is a seriously diverse menu: classic French meets Italian, with a dash of Asian. To start, there’s everything from duck spring rolls and stuffed calamari to carpaccio – paper-thin slices of fillet with celery, rocket and parmesan, dressed in olive oil. For mains the oxtail pot, braised and slow-cooked in red wine and thyme, is a delightful winter warmer. 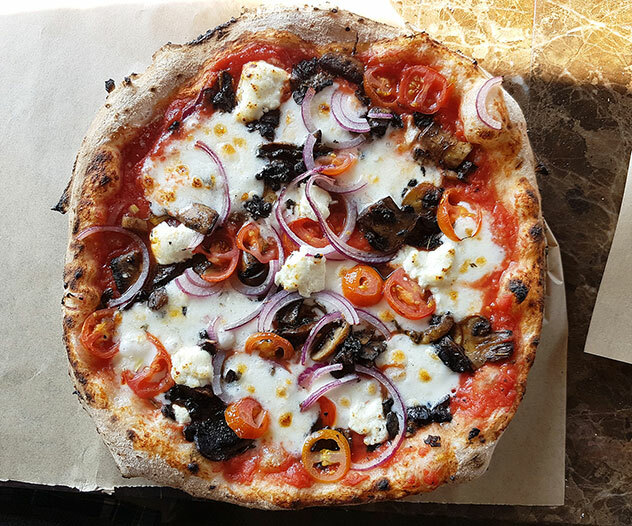 The pizzas are hard to beat: the dough is made using organic stone-ground flour, they make their own tomato base, the cheese and toppings are generous, and the pizzas are baked in a wood-fired oven. The New York cheesecake and the chocolate fondant are gloriously rich. Located at the palatial Venetian-inspired Southern Sun Montecasino hotel, this is a ritzy restaurant that impresses with its lavishness. Smoked meats from the in-house smoker come highly recommended. Try a scrumptious pork Kassler loin and pulled pork croquette served with apple mousse, roasted garlic, mashed potato and pork jus. The top-quality Karan beef sirloin, grilled and served with saffron potato fondant, carrot lasagne, chestnut purée and beef reduction is a good choice, too. End with the apple-and-blueberry pie, served with mascarpone ice cream, crème anglaise and almond brittle. Sunday lunches see a buffet on offer. If you’re on the breakfast bandwagon, options range from egg-white omelettes to breakfast wraps, salmon sweet potato röstis and smoothie bowls. The cocktail bar serves tapas such as golden fries tossed in pesto and parmesan, salt-and-pepper calamari and slow-braised pork belly with honey and soya glaze. At the main restaurant space, go for succulent Jack Daniel’s fillet medallions topped with garlic-sautéed shimeji mushrooms or pan-seared kingklip linguine with lemongrass velouté. Finish with the Rockets caramel chocolate bomb – salted caramel ice cream encased in a chocolate ball with hot caramel sauce. 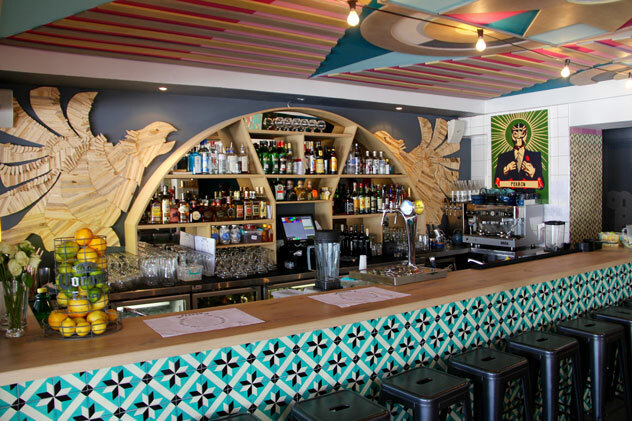 It’s a Cuban-inspired bar and eatery – inexpensive and unpretentious. You’ll find an eclectic mix of burgers, sandwiches, ceviches and even curry on the menu, which is divided into bar snacks and mains. From the snack offering, the crispy fried chicken bites are great: tender deep-fried nuggets covered in tangy home-made mayo. Favourites from the mains include crisp salt-and-pepper squid with a papaya chilli dip and mojo-rubbed pork roast that’s slow-cooked and sticky with orange basting, served with a fresh and crunchy mayo-free slaw. For dessert, opt for ice cream or an almond waffle with rum and caramel. Pull up a seat. Tomorrow is our last day open until 9 Jan. Come say so long, until 2019. After a tasty snack? Try the tacos, garnished with generous avo purée and tomatillo dressing. Other options include smoked paprika shrimp, citrus-marinated steak with kimchi, coriander, smashed black bean and corn, or beetroot hummus balls. The Americana-style fried finger foods include an indulgent deep-fried mac and cheese, a tower of waffles and popcorn chicken. For something lighter, the salads are farm-fresh. The speciality here is cheesecakes with flavours such as Oreo, Turkish delight, rum and raisin or honeycomb. It’s all about delicious food to go with the gins here. The drunk olives in warm gin and citrus are outrageously moreish. Flatbreads with smoked butter are another must. Then there are the small plates, like molten pork belly and crispy slaw, or beetroot and gin-cured salmon. On Sundays there’s a fixed-price braai including a starter and a G&T. Desserts sometimes flow into the cocktail territory; think Ginologist citrus-and-chocolate martini. The menu is divided into raw, cured, steamed, fried, kushiyaki (skewered and grilled) and desserts. Stand- out plates include herby seared venison with sriracha emulsion, cucumber salsa and ponzu; duck pancakes with kimchi, horseradish emulsion and hoisin; coal-fried broccoli with smoked gorgonzola and broccoli gremolata; and crumbed line-caught chokka (squid) served with piquant mango salsa and micro basil. Say yes to the churros with lime frozen yoghurt, cinnamon and orange jelly – they’re light and fresh. Small-plate dining meets gin bar at this quirky eatery that offers a choice of three dishes at a set price. Starters include asparagus spears topped with a perfectly poached egg and whipped hollandaise, or creamy duck-liver pâté with shavings of duck ham and granola crumb. Your second dish could be pasta, as both the mushroom tortellini and confit duck gnocchi are worthy contenders. Or consider a heartier option: dry-aged sirloin with chilli-and-herb pesto, or Middle Eastern quail with textures of aubergine and corn. For dessert there’s a gooey dark chocolate fondant with spiced biscuit crumb, honeycomb and summer berries. The menu is nice and small, with Portuguese classics like prego rolls, chicken livers and the most succulent espetada. Start with chorizo flamed in brandy before moving on to a meaty main. Feijoada – a traditional Brazilian bean stew with pork, beef and chorizo slices – sees individual flavours combining well with the succulent meat. If you feel like fish, the trout with crispy skin and perfectly flaky flesh takes 20 minutes to prepare, but it’s worth the wait. It’s grilled and served with hand-cut chips and a herb butter sauce. Portuguese stalwarts abound: think chicken livers, rissoles, flaming chorizo and a saucy prego trinchado for starters. For mains, choose a generously portioned dish from the house specialities. The crab curry is a messy yet popular choice. Try Lisbon’s traditional prawns, fried in a beer sauce, or the Churrasqueira steak, grilled with ham and cheese and served with a fried egg and ‘granny’s special sauce’. If your heart is set on seafood, you’re spoilt for choice. Langoustines, native lobster, prawns, kingklip, salmon, Falklands calamari and traditional cod fish are all tempting. On the meat side, you have a choice of several cuts of beef both on and off the bone, which can be prepared with Pigalle’s home-made basting sauce or coated with peppercorn mustard seeds. 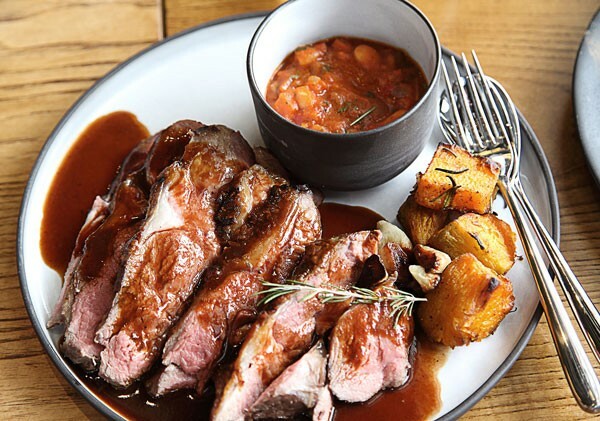 Portuguese steak fillet, pork belly, lamb shank and balsamic fillet are also available, as well as a small vegetarian offering that includes mushroom ravioli, wild mushroom risotto and south Indian tomato dhal. Desserts are delightfully traditional – from malva pudding to cheese and biscuits. Order a selection of items to sample around the table. The rissóis de camarão (prawn cakes), chorizo, livers and squid as entrées are superb, or try a Parreirinha platter. The caldo verde (collard greens and potato soup) is amazing. For mains, the restaurant is known for its prawn dishes, including prawn curry and grilled prawns and chips. The Bacalhau à Brás (salted cod fish) is superb, as is the steak trinchado cassarola. For a sweet treat with your coffee, spoil yourself with a crème caramel and a Parreirinha barril de nata (their special barrel-shaped pasteis de nata). Start with tapas of sesame tuna medallions marinated in tataki sauce and the pork riblets grilled in a sweet and sticky barbecue sauce. The sushi is fresh and beautifully prepared: the strawberry and salmon rainbow rolls are a chef speciality. Seafood choices range from East Coast sole and Falklands baby calamari to grilled Mozambican prawns marinated in chilli, garlic and lemon. Vegans will enjoy the tomato three-bean curry or mushroom risotto. 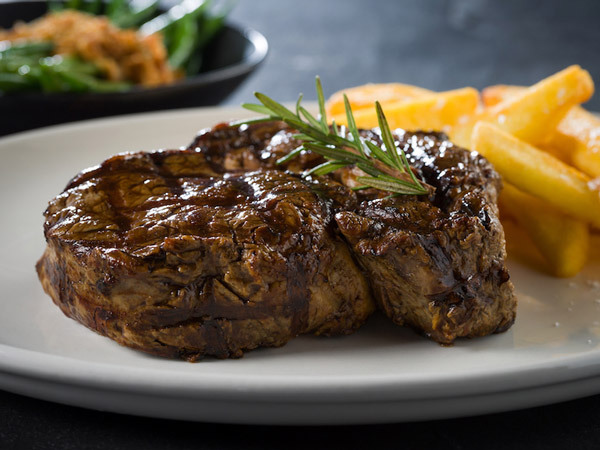 For the meat-eaters, a rib-eye steak or ostrich fillet are fail-safe choices. Classic desserts such as malva pudding and chocolate fondant should not be missed. For starters, try the fishcakes – large pieces of poached salmon, lightly crumbed and fried until crisp then served with sweet-chilli sauce – or the creamy chicken livers served with hot Portuguese rolls. The platters with perfectly cooked halloumi, skewers, calamari, chicken wings, olives and feta are ideal for sharing. A must-try main is the creamy peri-peri fillet. Grass- or grain-fed, on or off the bone – you can specify the exact cut and weight of your matured piece of beef, whether local or imported, and have it grilled with basting or spices. Vary your experience and opt for venison or splash out on Wagyu. Chakalaka is among the sauces on offer and sides include homely roast pumpkin, creamed spinach, pap and mashed potato. Non-carnivores need not starve – there’s seafood and fish from the grill, as well as a vegetarian platter and burger and many salads. Desserts include malva pudding and chocolate brownies. Start with their bites: zucchini fries, citrus olives or a small plate of Jamaican jerk barbecue ribs or jalapeño chicken livers. Popular mains include half spit-roasted chicken served with fries or a mezze salad. If you are sharing, the meat tasting board, including crispy wing skewers, Jamaican jerk ribs, pork belly strips, lamb koftas and pumpkin ale fritters is a favourite. The rump and rocket salad – with matured rump cut into strips on a bed of pickled radish, caramelised baby onions, feta, tomatoes, spinach and chilli balsamic reduction – is perfection. The honeycomb affogato, honeycomb gelato and a single-origin espresso is the sweetest way to seal your meal. It’s meat all the way at this popular restaurant. Starter options include a butternut soup, grilled calamari, chicken livers and mussels. For mains, a variety of cuts are grilled and come either basted or spiced. There’s also beef kebabs, lamb saddle cutlets, beef ribs, ostrich medallions and venison. There are plenty of sauces: peri-peri, pepper, mushroom, monkeygland, cheese and mustard. Choose from sides like pap and chakalaka, creamed spinach and seasonal veggies. The fresh garden salad lives up to its name, while the rump goes down well with a glass of shiraz. End on a sweet note with the hot chocolate brownie. Bowls containing fresh olives and home-made potato chips welcome you to your table. For starters, there’s Italian tomato soup, traditional boerewors, Hussar beef biltong, chicken livers and a mussel pot. 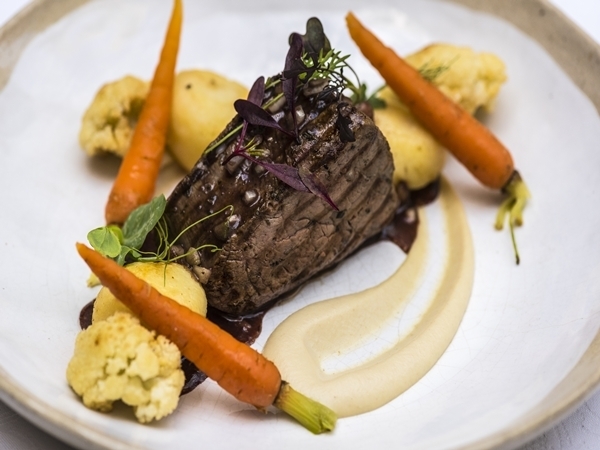 The fillet steak comes with the option of oven-baked veggies and a selection of sauces. The beef fillet is juicy and tender but other options include pork, lamb, ostrich and game. For something light, try the Hussar burger, the Hussar grilled chicken breast burger, the Hussar steak roll or fried haloumi. Chocolate fondant, baked cheesecake and malva pudding feature as desserts. For 16 years, owner Steve Maresch has been perfecting the art of the elevated steakhouse experience. Beef – both grain- and grass-fed – is sourced from local farmers as far afield as Brazil. It’s aged (wet or dry) on the premises and cooked to your heart’s desire. Start with smoked salmon with avocado and capers, or the venison skewer. A juicy 500g sirloin on the bone with bone marrow is cooked perfectly medium rare and served with mustard sauce. The sausage feast features boerewors, Persian lamb sausages and venison wors. An extensive dessert selection includes home-made chocolate brownies and malva pudding. Everything is cooked on an open flame at this laid-back venue. The menu starts with nibbles, such as smoked lamb ribs with oven-dried tomatoes, olives and mint sauce; grilled calamari and chorizo with caramelised onions, baby potatoes and salsa verde; and grilled brown mushrooms with a pea purée. 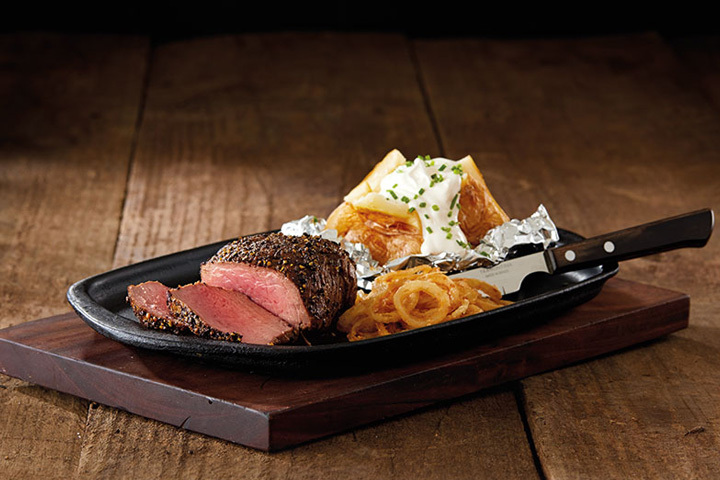 For mains, the rump steak is a must: spice-crusted, flame-grilled to perfection and served with blackened butter. Or go big with the 1kg T-bone (serves 2 to 3) served with a burnt leek sauce and gremolata. Notable too are the cheeseburger and the harissa butter king prawns with pickled cucumber. Thundergun is one of Jozi’s original steakhouses, serving rugby-player portions of ribs, steak, eisbein and carvery roasts for 50 years. The bacon-and-avo burger is juicy and generous, while the ribs dwarf their serving platters. Steaks range from 200g to a whopping 800g and are served with crispy fried onions, thick-cut chips, baked potato or pumpkin and creamed spinach. Add a sauce such as monkey gland or jalapeño. Desserts are old-school favourites: chocolate mousse and crème caramel. Karan beef, salads, seafood, chicken and stews feature strongly. Perfect starters include springbok carpaccio, ‘Firecracker’ chicken wings glazed with bourbon sauce and garlic-and-lemon calamari. For mains, try the Kobe-style Wagyu with truffle-butter infused wild mushroom or the ‘Ducking and Diving’ chicken on a spear, spiked with chorizo, onion and peppers, and cooked on the grill with a choice of sides. There’s a wide selection of burgers, ribs and seafood dishes that cater for most tastes. The small dessert menu boasts popular local classics like malva pudding. Soups like the tomato-based mussel, prawn and calamari seafood; creamy butternut; and tomato with white wine are a tasty start. The snails in a brandy and garlic-butter sauce is a delicious highlight. The menu is a wealth of well-sourced, tender and beautifully cut meat: beef, lamb, boerewors, oxtail and more made almost any way you like (grilled, basted, coated in pepper or chilli; potjies) and accompanied with fancy chimichurris and snail sauces, or more familiar cheese, mushroom, green pepper or monkeygland. 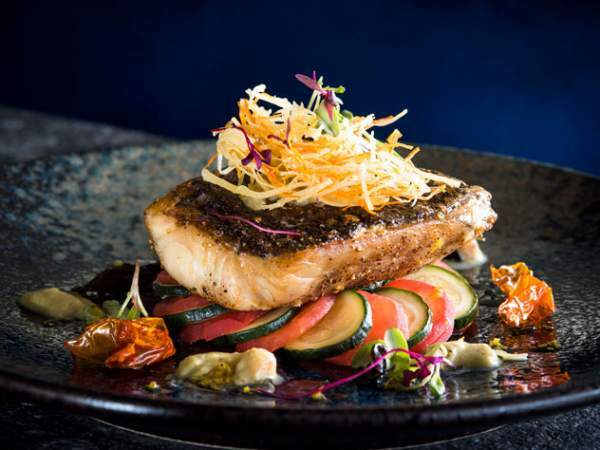 Kingklip fillet with lemon-butter sauce flakes beautifully, while vegetarians can enjoy the aubergine stack or a curried coconut potjie. Italian kisses, crème brûlée and baked cheesecakes end the meal nicely. A steak at Turn ‘n Tender. Photo supplied. Start with a trio of subtly smoked carpaccio – kudu, crocodile and ostrich. Don’t fill up on the bread basket and exceptional anchovy and garlic butters. Mains range from duck confit to veal; Norwegian salmon to quail. The chef’s signature dish is a tender fillet on the bone served with marrow and a rich and flavourful mixed mushroom and red wine sauce. Dessert should be the heavenly home-made rosewater ice cream with Turkish delight, nougat, chocolate, rose petals and topped with a raspberry sauce. 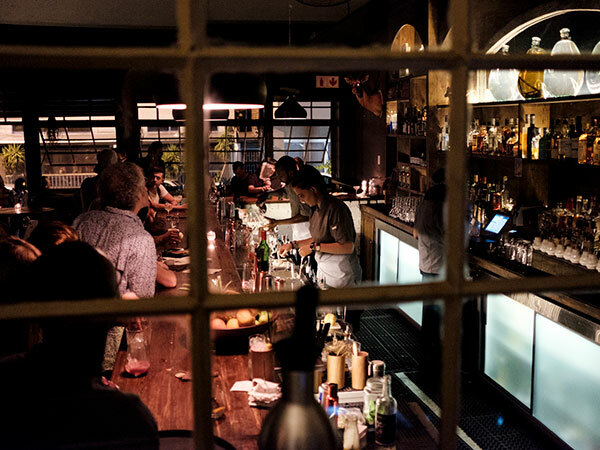 This list of great restaurants in Joburg is by no means exhaustive (we know there are loads more gems), but it contains all the eateries that were rated highly enough to make it into the Eat Out 500, a power list of the country’s best restaurants reviewed for the 2019 edition of Eat Out magazine. Any additions are based on ratings by critics during the year and by the editorial team.